We are situated on the Balule Parsons Nature Reserve in the Mopani region, approximately 40km north of Hoedspruit and only a 4km game drive away from the banks of the Oliphant’s River. Parsons Nature Reserve forms part of the Greater Kruger National Park and we offer easy access to Kruger Park gates. This unspoiled corner of South Africa is renowned for its abundance of wildlife, mountainous scenery, indigenous forests, cascading waterfalls and diverse cultures. 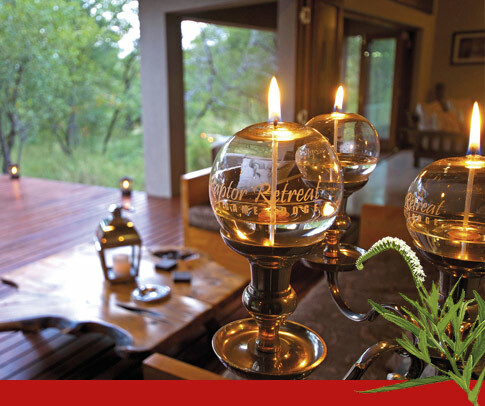 Raptor Retreat is an owner managed game lodge, offering luxurious accommodation and excellent service. Enquire how we can make your trip even more comfortable with easy airport transfers and exciting excursions. At the heart of Raptor Retreat is the Main Lodge where guests can gather to either dine or catch up on their adventures. Relax with a drink on the deck or slump into one of the sumptuous leather couches. The huge deck looks out over an open plain where herds come to graze or drink at the water hole and predators wait for an opportunity. Hearty meals are served twice a day in the dining area, or on the deck, where you will experience good old-fashioned home cooking. For those authentic South African bush meals, think outdoor boma, fire pit and stars. Think sizzling braai and special fun. Lunch is optional and menus are available on request. Served between 13h00 and 15h00 daily. Enquire for more information on this and other items/services that can be booked or purchased at the Main Lodge. Special dietary requirements should be arranged beforehand during the booking process. We regret that we unfortunately cannot cater halaal or kosher. Game drives are done twice a day - one in the morning (05h00 in summer and 06h00 in winter) and one at 16h00 in the afternoon on a 11 000 ha Big Five traverse and will leave from the parking area outside the main lodge. The cost for these are R400/person per drive. Bush Walks are available on request and these are R380/person and are done in the mornings only. Morning and afternoon game drives includes refreshments and snacks. Please note that this is the current rates and are subject to change depending on how far in advance you booked. Airport transfers are available from Hoedspruit and Phalaborwa and the cost is R300/person one way. We can also offer transfers from OR tambo International - price on request. The accommodation at Raptor Retreat is some of the best the industry has to offer. We offer early morning or late afternoon informative game drives. We offer adventures for every taste, from full day safaris to an Elephant Experience. Raptor Retreat is the perfect choice for couples seeking a serene getaway together to celebrate a special occasion. Make your next holiday one to remember.